Triton T80si 7.5kw Water Heater for the professional hairdresser. With 2 setting power selector and variable temperature control with 1.5m hose. 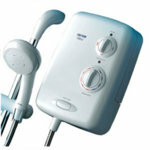 Professional water heater for all washpoints.